In the round of craps, 'Come out Rolls' implies to an opening roll. This point is recognized only when the total of the dice are four, five, six, eight, nine or ten. If come out roll has values of seven, two, three, twelve or eleven, then the round is terminated instantly. After the point is decided an "ON" puck is placed on that point. These bets have to be placed on a Pass Line before come out roll. In case, you roll a seven or eleven, then you triumph the round and you will lose if you roll two, three, or twelve, which is also called 'Craps'. To win this bet you will need to roll a point prior to rolling a seven. These bets are just the opposite of Pass Line bets and have to be placed on 'Don't Pass Bar' before come out roll. If a seven is rolled prior to this point, then you will win. 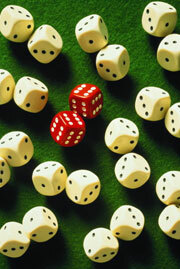 Another way by which you can win is by rolling craps or other attempt with sum total of seven. In case come out roll come to twelve, then don't pass line wager will be reinstated back to you. You have to place your chips into a box marked as 'Come' to establish 'Come Bet. If the subsequent roll comes to seven or eleven, then you will win money immediately. You will lose instantly, is the subsequent roll is two, three or twelve. This point is also established if a shooter is able to roll ten, nine, eight, six, or four. These bets are consequently replaced from 'Come Bar' to a box that displays the come point. If come point gets rolled prior to a seven, then you succeed. This bet is just the opposite of come bets and is made after come out roll. These are placed on 'Don't Come Bar'. In case, two or three is rolled, you will win. The players are given back the bet in a push, when twelve is rolled. This point is established when a shooter rolls a four, five, six, eight, nine or ten. You will if seven is rolled and will lose if don't come point rolls out. You get even money with don't come bets. These bets refer to backup bets that can be placed on don't pass, pass, don't come and come bets. You can place bets with values up to 3 times the worth of your initial bet. Come odds and pass odds payout in the ratio of 2:1 if four or ten is rolled.